This amazing recipe is courtesy of DamnDelicious, cuz it is!!! She’s not living a super strict lifestyle like me, but I love that she keeps it simple and clean (for the most part 🙂 ). Hey, if I wasn’t forced to I’m sure I wouldn’t. Heck, I can’t even have the good and wholesome garlic (because of my food sensitivities). 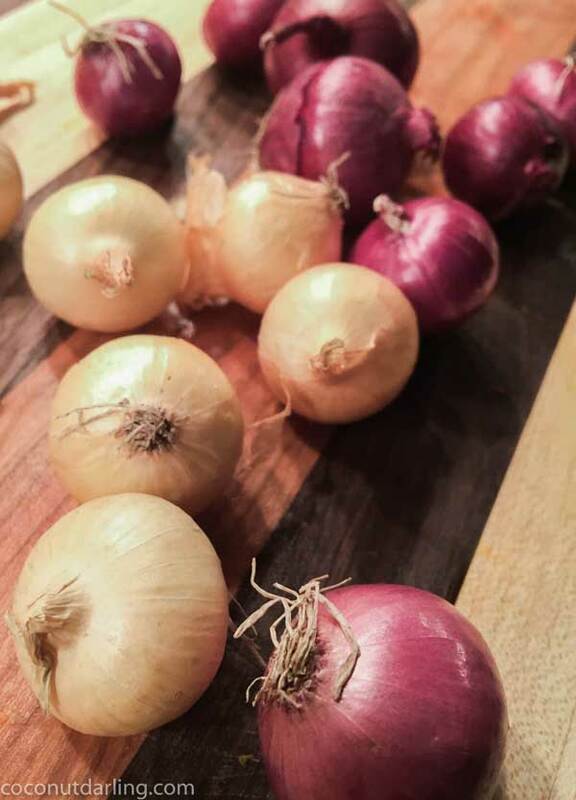 I have to use pearl onions instead. But ain’t they purdy!? So stinking’ cute, those guys. 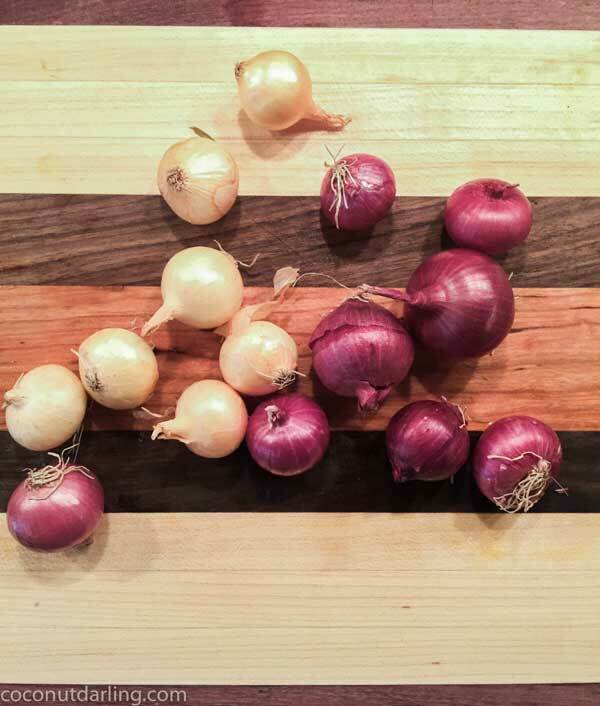 Even though this recipe might be a little more time consuming then you want, it’s super easy. 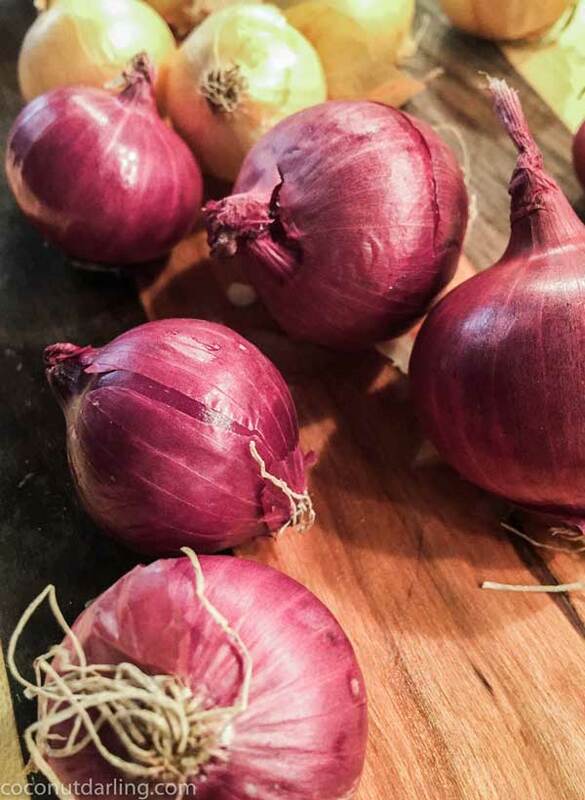 You could even pre-prep the veggies to save on time. A little bit of roasting, a little bit of blending and voila! You have soup!! 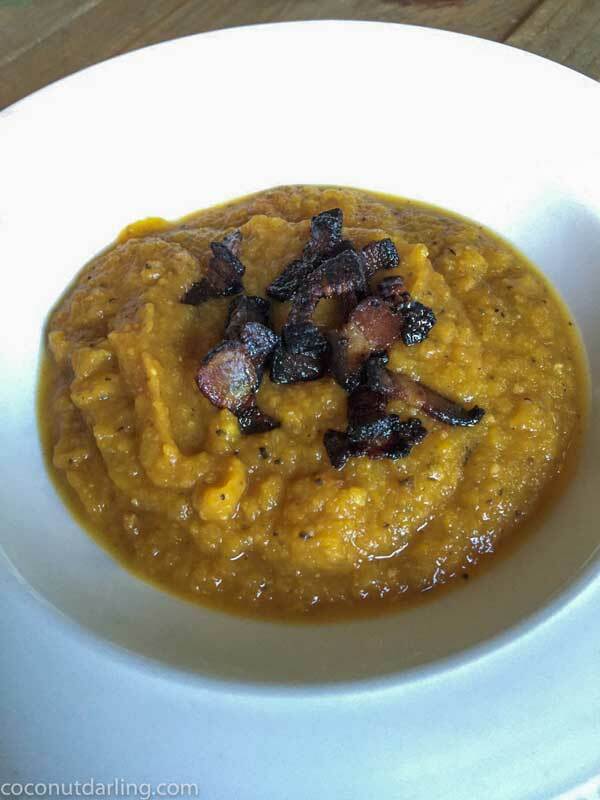 Need I say, again, bacon infused soup!! Full of flavor!! The thyme adds magic to the flavor, as well. Chungah, from Damn Delicious topped her soup with bacon, goat cheese and chives. Which, in the perfect world, is a winner. My case, not so much. For some reason (explained more here) I can handle greek yogurt, but not other dairy products. Greek yogurt was my winner on this day (and most days) 🙂 . It made me a happy camper. Preheat oven to 400F. 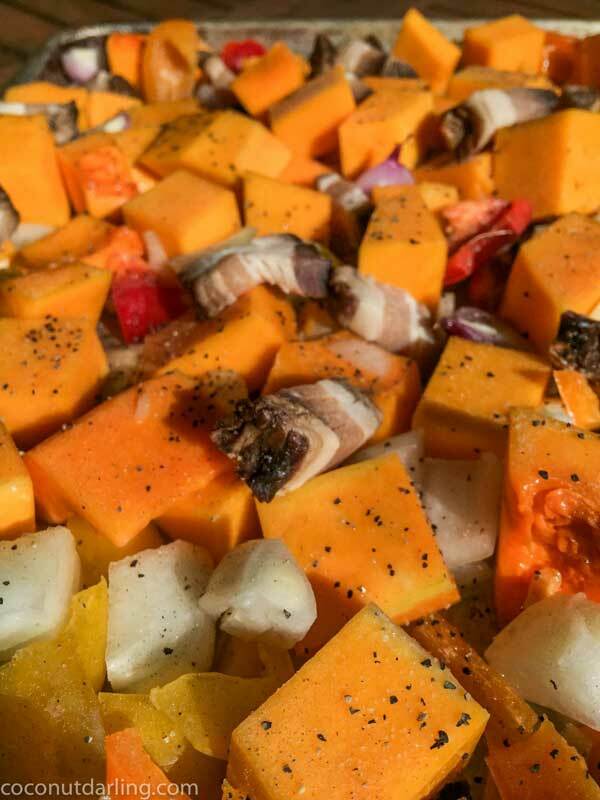 Put the coconut oil on a baking sheet and let melt while it is preheating (and you are dicing the veggies). 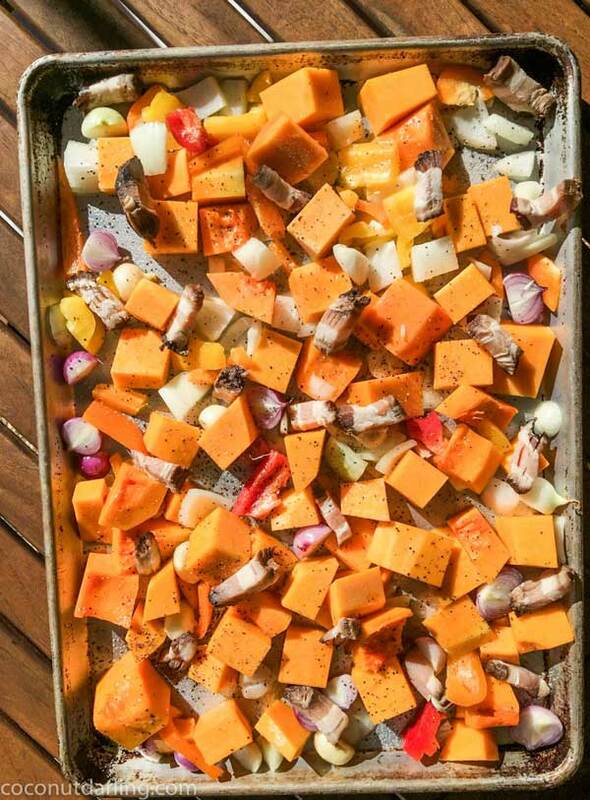 Once diced (and coconut oil is melted), place the veggies along with the first 4 slices of diced bacon in a single layer on the baking sheet. Sprinkle with salt and pepper. Give it a quick stir to coat with the coconut oil. 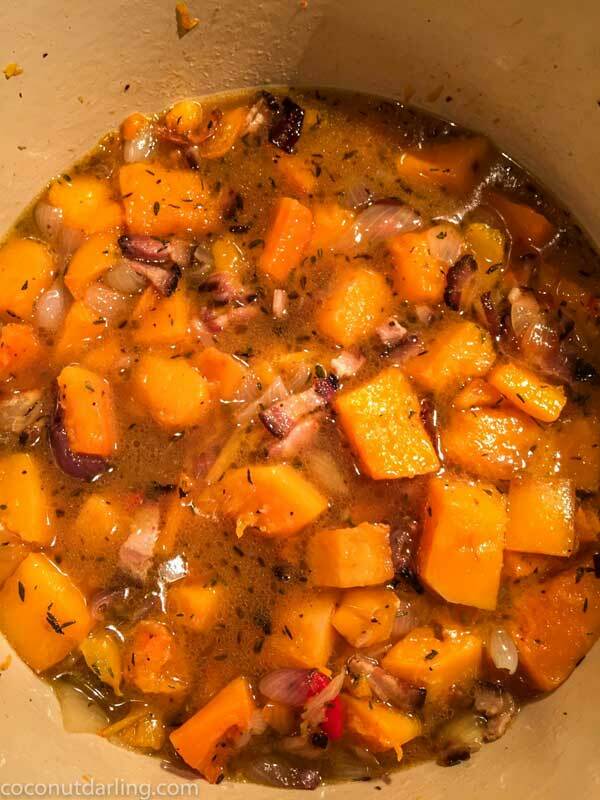 Bake for about 25-30 minutes or until the squash has softened. Make sure to stir half way through. 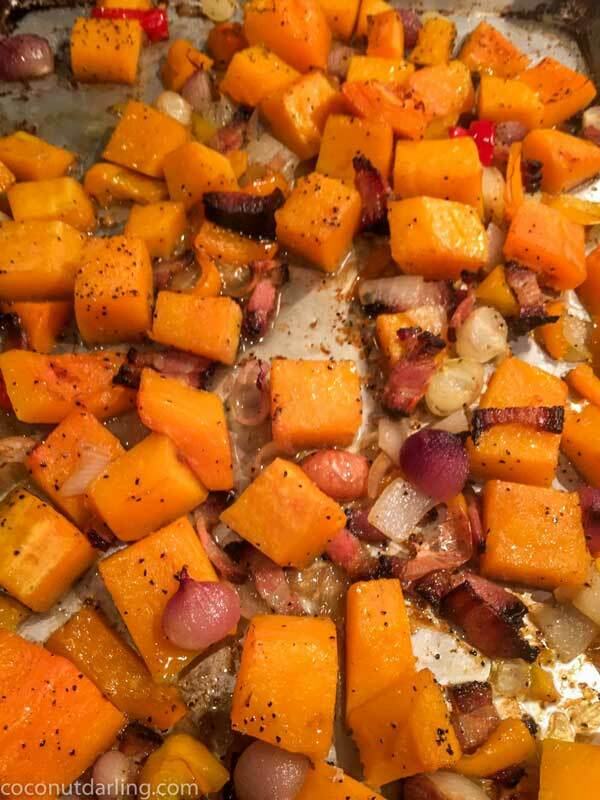 While the veggies are tenderizing in the oven cook your bacon over medium high in a skillet. Set aside on a paper towel topped plate. When the veggies are finished get a stock pot or Dutch oven on the stove over medium heat. Add the veggie mix along with the thyme and cook for a few minutes (stirring occasionally) so that the thyme becomes nice and fragrant. 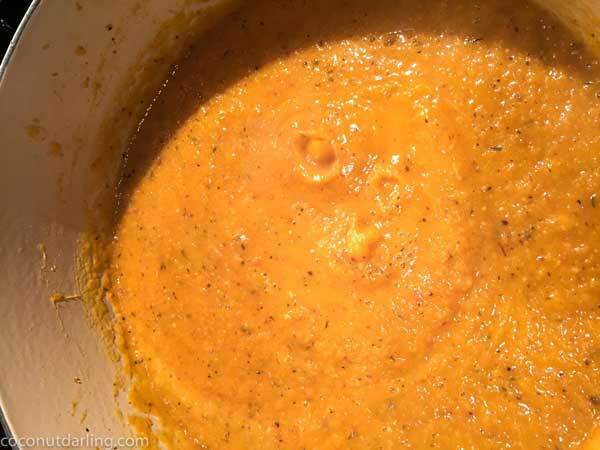 Pour in the chicken stock and blend with an immersion blender. Add salt and pepper to taste. Bring to a boil and then reduce the heat to a low simmer so that the soup thickens up. This takes about 5-10 minutes. If it gets too thick, add some more chicken stock. Serve immediately. Garnish with bacon and a dollap of greek yogurt, if you prefer. 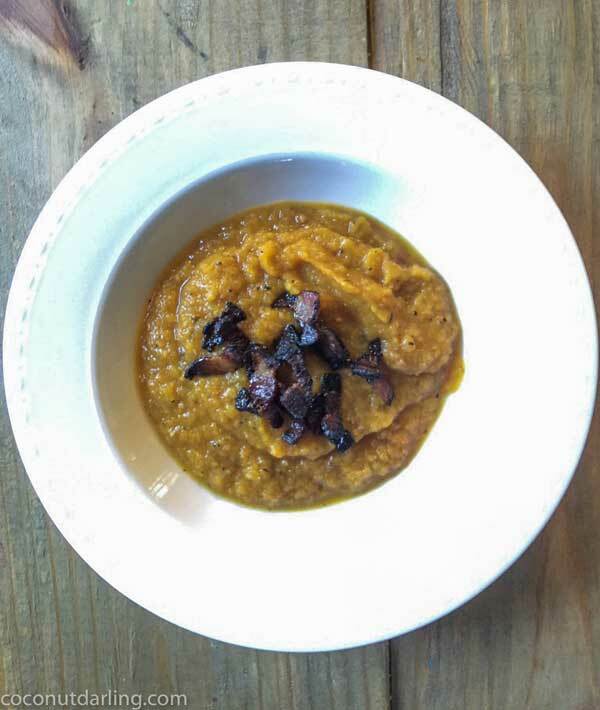 Don’t be afraid to use frozen butternut squash if you can’t find it fresh. Sometimes I am colder in the summer then I am in the winter due to the dang AC. No better way to warm up then soup!! I have a love hate relationship with the AC. We battle all day long. Too hot, too cold. Or maybe it’s just my hormones. Wouldn’t put it past them. Haha. Just me? Come on guys (or I guess I should say gals). Relate much? This post reminded me that there is much to be thankful for. Thank you for reminding me! The receipts are something to be thankful for too. Anything with bacon is GOOD! Can’t wait until my kitchen is put back together to try these out (kitchen is under construction). You are very welcome!! I have to remind others to remind myself!! haha!! Thank you for taking the time to read my rambles Shari 🙂 I can’t wait ’til your kitchen is ready either!! I wanna go cook with you in it!! You have the patience of a saint to be able to put up with the construction! !